I don't think anybody likes it, but I have been known to feel so strongly against throwing up -- and try with all my might not to -- that when I finally do, I also pass out. And cry. Then fall against the bathroom door so my husband can't get in to check on me. You see, before I met Mark, I wasn't around people who had serious health problems. In my mind, if you needed to expel the contents of your stomach back out through whence they entered, you were really sick. This could be due in part to accidentally seeing a good chunk (chunks, ew) of The Exorcist when I was too young (like, 9 maybe?). ...made me afraid of under my bed for years. At bedtime I would switch off my light and run and jump onto my bed so as not to let my ankles linger next to the side of the bed so nothing could grab them and pull me under. Also, I still think horror movies that have to do with demon possession and exorcism are THE SCARIEST of them all. This one time when I was eight or so, after eating a burger, fries and a chocolate shake for dinner, I woke up in the middle of the night sick to my stomach and threw up all the way from my bedroom to the bathroom. I literally left a trail of vomit as I went. I didn't drink milkshakes for years after that, convinced they were evil. This is one of my most vivid childhood memories. My high school held a blood drive every year and once you reached the age of 16 you could donate. After I did so for the second consecutive year, I was sitting at the table in the library where the cookies and cups of juice were when I became dizzy. I looked around for someone to alert. I spotted a guy I knew and called out to him. Next thing I knew, I was waking up on the floor, having passed out, and thrown up a little as I did so. When I was in my first trimester with my daughter (my son didn't make me nauseous, thank God), I kept saltine crackers with me at all times to try to keep the barf at bay. One day after work I became very nauseous, but being me, I tried my hardest to not need to hurl my lunch. To my dismay, it had to come up. Mark must have sensed my plight, because he called to check on me as I pitifully sat crying on the bathroom floor. So me and vomiting have had a very rocky and emotional relationship. 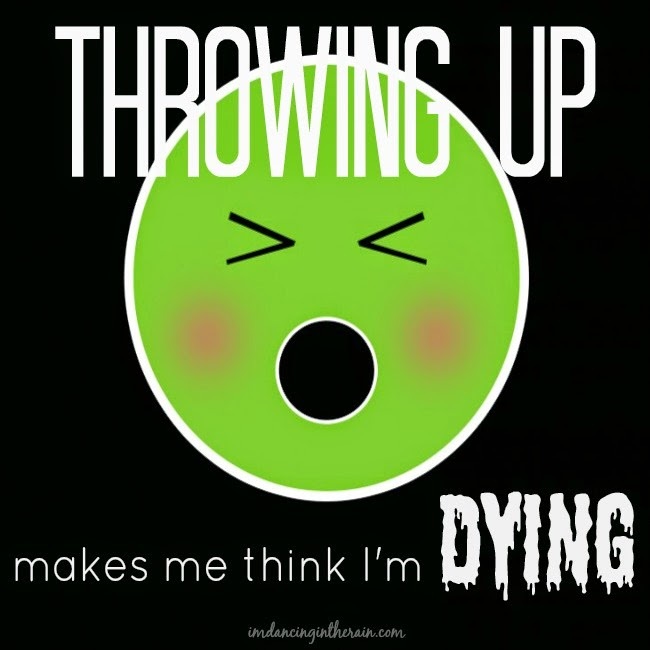 It took me many years to get used to the idea that throwing up doesn't necessarily indicate imminent death. Because with Mark, it usually just means his body can't handle something he's ingested, and he feels better if he gets rid of it. Also, children. When you've been covered in vomit over and over nursing a small child with a stomach bug, the trauma of it all lessons. This post was inspired by the Finish the Sentence Friday prompt: "I thought I was going to die when...". Also, I'm a co-host this week, so if you're a blogger, go write something and come back here to link it up!